Presented by the Errol Flynn Society of Tasmania Inc.
Be 'in like Flynn' to 10 days of events! One hundred years after his birth in Tasmania, Errol Flynn reigns as the supreme swashbuckler in the history of film. To millions during the Thirties and Forties, Flynn epitomised glamour, action and romance in cinema classics such as "Captain Blood", "The Adventures of Robin Hood" and "The Sea Hawk". If Errol’s journey from the Hobart suburb of Battery Point to international stardom during Hollywood’s ‘Golden Age’ was just as action-packed as those he portrayed on-screen, it was also more improbable – and certainly more controversial. His was a personality that was larger than life in every respect: a unique mixture of charm, urbanity, recklessness, indulgence, swagger and non-conformity that seduced and outraged many, kept courts and newspaper front pages busy, and left Flynn himself burnt-out and prematurely dead at the age of 50. But nobody has wielded a sword, swept away a damsel or filled a pair of tights like Errol Flynn since he first commanded the world’s attention. He was, and is likely to remain, Tasmania’s most famous son. 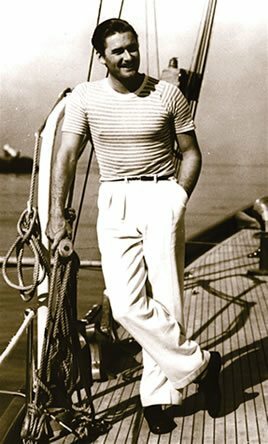 The Errol Flynn Centenary Committee invites you to celebrate the life and achievement of this complex legend. With movies at the State Cinema in Hobart, memorabilia at the Tasmanian Museum and Art Gallery, swordfighting in the Elizabeth Street Mall, or partying with Errol’s daughter Rory and grandson Sean at the Heart Foundation Gala Ball on the actual night of his birthday, it’s the most fun you’ll have in a 100 years!